Violinist Andrew Bird will play two shows in the coming days – Friday in Wilmington, Del. and Monday in Princeton, N.J.
Andrew Bird stands out in the Kardashian era. Commercial appeal isn't his primary motivation. The former member of Squirrel Nut Zippers doesn't clamor for fame or fortune as a recording artist. "There are more significant things in life," Bird said. The quirky singer-songwriter aims to challenge himself and raise the sonic ante with each release. Bird alternates between crafting straightforward singer-songwriter albums, such as 2016's surprisingly confessional "Are You Serious." And then there are the ambitious instrumental albums. Bird's latest project, "Echolocations: River," is his second release of instrumental recordings. It's the follow-up in the avant series to "Echolocations: Canyon." The initial album was recorded in Utah's remote Gulch canyon and the latest sonic experiment was captured along the Los Angeles River. "These projects exercise other parts of my creativity," Bird said while calling from his Los Angeles home. "'Echolocations' is an idea that I came up with to satisfy the curiosity for my love of outdoor spaces and acoustics. It's the idea of reacting to your environment as opposed to imposing your will on the environment. When I'm writing these songs, it takes a lot of restraint as a player." 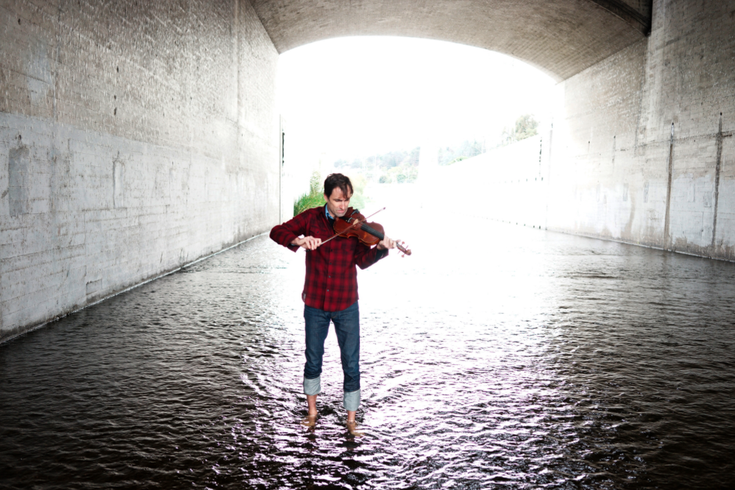 "Echolocations: River" was literally recorded while Bird was wading up to his ankles in the the Los Angeles River. The latest project is quite a contrast from the canyon album, a seven-piece violin suite, which utilizes the natural reverberations of the Gulch canyons. Bird, 44, a veteran multi-instrumentalist, didn't have to travel far for "Echolocations: River." It was recorded around the Glendale-Hyperion bridge in his Atwater neighborhood. "Making this album was much easier than 'Echolocations: Canyon,' since I ride my bike along it all the time," Bird said. "For the canyon project, I flew to Salt Lake City, drove six hours to Southern Utah and then hiked and rappelled another five hours to where the recording was done...I wanted each album to feel distinct from the one before it." The common denominator for Bird, who will perform tonight at Copeland Hall in Wilmington, Del. and Monday at McCarter Theater in Princeton, N.J., is water. "There are so many different elements to think about with water," Bird said. "There is the sound. And for when I recorded this, there's the water quality. The water there is fairly clean and it has this strong aroma of ammonia or something like that. But water is life." "Echolocations: River" is an album played within a natural acoustic setting featuring Bird on violin. It's chamber music with environmental soundscapes. "It's definitely something different," Bird said. "I think it's a good thing. I don't want to follow trends. I would rather push the envelope with my music...There's a time and place for everything." Bird will continue working on his avant-garde series. "The next one will be the Marin Headlands. Who knows how that will turn out? The unpredictability is part of the fun. It's also good for a recording artist to take a risk. I'm always up for a good risk." Andrew Bird appears Friday, Feb. 23 at Copeland Hall, 818 N. Market St., Wilmington, Del. Show time is 8 p.m. Tickets are $43, $47 and $51. He then appears Monday, Feb. 26 at the McCarter Theatre, 91 University Place, Princeton, N.J. Tickets are $42 and $46. Show time is 7:30 p.m.